Home / Help / What is IPHost Network Monitor? IPHost Monitor provides you with a number of monitoring features that allow you to check the state of almost all critical enterprise servers and applications in real time. The tool checks the availability of network resources being monitored and their performance simultaneously. 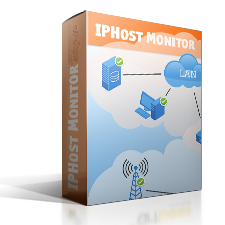 IPHost Monitor automatically searches network servers, workstations and other equipment, and detects network services running on them. Regular network rediscovery allows adding new monitors and tracking equipment relocation/presence in real time. An application template allows to create several preconfigured monitors on the selected host at once. An application template can be constructed to monitor an application running on the host (for example, MS Exchange Server), or Web service (MS IIS or Apache), generic mail service or specific MTA (for example, Dovecot/Exim4). An application template applied to the host can monitor either overall host system health (traffic consumption, CPU, memory and disk space usage), or essential services running on the host (for example, AD domain controller services). The IPHost Network Monitor contains over 50 preconfigured application templates and provides tools to create custom ones. Also, there is IPHost Template Community – a useful online resource containing many additional application templates and knowledge base articles. Templates are reviewed by IPHost team and you can gain access to approved ones right from the IPHost client. You can also publish your templates and subscribe to digest e-mails. Warning: the resource is available but its response time or the response itself makes it difficult to use the resource. You can configure IPHost to perform different types of checks to trap such non-fatal issues. Down: the resource is unavailable: poll ends with a timeout or reports a fatal error. You can add more condition checks to trap other problems that you consider fatal. State condition checks for both levels are similar so it is more a logical distinction of fatal versus non-fatal errors between them that you should keep in mind when configuring the system. Monitors can inherit their alerting rules from hosts, host groups and so on, as well as use global named alerting rules. This framework helps to reduce your efforts on defining and changing the alerting settings. A summary report for all the network resources or for a monitor group allows you to locate problem resource(s) immediately. A detailed report for a specific monitor provides you with complete information on all events that occurred during a selected time interval. It helps you to identify the exact problem cause. All reports are generated in HTML form, so you can easily send them to your colleagues or superiors. Each report is also accessible in a browser via a specific URL. The regular daily/weekly/monthly reporting feature allows you to monitor trends and create reports for your manager. IPHost Network Monitor offers a specialized Web interface for mobile devices optimized for small screen resolution and slow connection speed. The entire monitoring data is stored in a relational database (Firebird). You can use this information for creating custom reports.